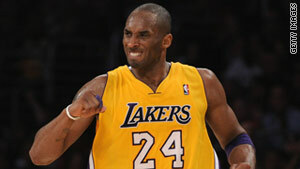 "The words expressed do not reflect my feelings towards the gay and lesbian communities," Kobe Bryant said Wednesday. The NBA says, "Such a distasteful term should never be tolerated"
(CNN) -- The National Basketball Association fined Kobe Bryant of the Los Angeles Lakers $100,000 on Wednesday for "offensive and inexcusable" comments he made during Tuesday night's game, the league said in a statement. Bryant used an expletive and an anti-gay slur directed at a referee after receiving a technical foul in a game against the San Antonio Spurs. In a pregame phone call Wednesday night to Joe Solomonese, president of the Human Rights Campaign, Bryant apologized for using the slur, the commission said in a statement. "We had a very sincere conversation in which he expressed his heartfelt regret for the hurt that his words caused," Solomonese said. "He told me that it's never OK to degrade or tease, and that he understands how his words could unfortunately give the wrong impression that this is appropriate conduct. At the end of a difficult day, I applaud Kobe for coming forward and taking responsibility for his actions." Earlier, Bryant issued a statement saying his remarks should not be taken literally. "My actions were out of frustration during the heat of the game, period," he said. "The words expressed do not reflect my feelings towards the gay and lesbian communities and were not meant to offend anyone." But, said NBA Commissioner David Stern in a statement, "Kobe Bryant's comment during last night's game was offensive and inexcusable. While I'm fully aware that basketball is an emotional game, such a distasteful term should never be tolerated. Accordingly, I have fined Kobe $100,000. Kobe and everyone associated with the NBA know that insensitive or derogatory comments are not acceptable and have no place in our game or society." The Human Rights Campaign said earlier it supported the fine. "We applaud Commissioner Stern and the NBA for not only fining Bryant but for recognizing that slurs and derogatory comments have no place on the basketball court or in society at large," Solomonese said. "We hope such swift and decisive action will send a strong and universal message that this kind of hateful outburst is simply inexcusable no matter what the context." The Gay and Lesbian Alliance Against Defamation also issued a statement supporting the decision. "The NBA has sent a clear message to sports fans everywhere that anti-gay slurs have no place in the game," said Jarrett Barrios, president of the organization. "... This decision will serve as an important precedent that will help ensure a safer, more inclusive environment for fans and players everywhere, and we look forward to continuing our dialogue with the NBA."